To turn off an option that is on, prefix the option name with NO on command line or in OPT options file. @filename MALE Options in Z390.OPT file if found. Retrieve additional options from free form text file with default suffix OPT. Options can be specified delimited by spaces on as many lines as requires. All characters on a line following * are ignored as comments. The @file option can be nested. The default path is the program path. If a file named Z390.OPT exists in the z390 install directory, these options will be applied first as default options. ALIGN A YES Align DS/DC data fields based on type unless explicit length is specified. If duplication factor is 0, then NOALIGN is ignored. 1) No quotes required for SETC variables. 2) Duplication factor does not require (..). 8) Allow AREAD and PUNCH file records greater than 80 characters. The default of NOALLOW insures HLASM compatibility. 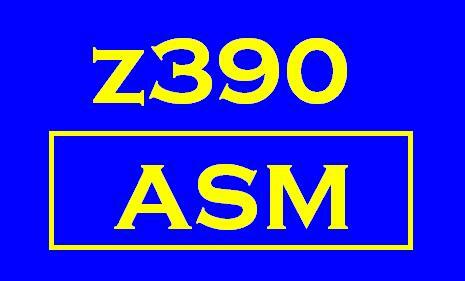 ASM MA YES Run az390 assembler as subtask of mz390 passing BAL. Note NOASM is for use in pure text processing programs which only use conditional macro code and AREAD/PUNCH with extensions to process ascii text files. NOASM does not support ordinary symbol attribute tests, OPSYN, or lookahead mode, and requires CHKMAC(0) and CHKSRC(0-2). ASSIST MAE NO Enable assembly and execution of 11 new ASSIST extended instructions to simplify I/O for student use. This option also sets NOLOADHIGH. See ASSIST Support. AUTOLINK L YES Search for unresolved external references in SYSOBJ directory list which defaults to linklib. 2 - check MLC, MAC, CPY, and BAL input source files for any non-ASCII characters and issue error. 3 - also check for out of sequence characters in 73-80 or any non-blank characters beyond 80 and issue error. Note this should detect any EBCDIC literal character strings containing non-ASCII characters such as binary 0 byte which must be changed to hex X'00' type strings for portability. CICS MA NO Support EXEC CICS pre-processor expansion and constants. If this option is not on during macro expansion, PROLOG and EPILOG option settings will be ignored. CODEPAGE(ascii+ebcdic+LIST) MALE YES The default is CODEPAGE(ISO-8859-1+IBM1047). If +LIST is added the mapping of the 2 codepages along with printable character and Unicode values are displayed on ERR file. A hex dump of the tables and a list of the valid ASCII and EBCDIC Unicode Charset codepages are listed. There are 162 Charset codepages available on J2SE 1.6.0_16 including 64 valid ASCII and 15 valid EBCDIC codepages. If the EBCDIC codepage you need is not on the host system, you can replace the EBCDIC codepage name with a file specification such as IBM1047.HCP (example included) which is in hex dump format. The above defaults match z/OS nnd has been successfully tested on Windows Vista and XP. CON MALE YES Console output for all start/stop, error, trace, MNOTE's with level > 4, and WTO messages. When the TRACE??? option is specified, the CON option is turned off so only start/stop and abort error messages appear on console log. You can specify CON after last TRACE option to turn it back on if you want all display, trace, and error messages displayed on console log. All the trace messages appear on corresponding TR? file for each z390 program executed. EPILOG M YES Generate epilog macro call DFHEIEND for CICS program at END statement if CICS option and EPILOG option are on. ERR(100) MALE 100 Terminate process if total errors for program exceeds limit. Use ERR(0) to eliminate any error limit and always generate PRN file. ERRSUM M NO Generate critical error summary on console and ERR file listing missing macros and copybooks. This option requires ASM option and is turned on automatically if missing macros or copybooks are found in the executed macro code path. When ERRSUM is on, ERR(0) is set to prevent abort prior to finding all macro and copybook references. All errors are listed on ERR file along with summary report. Note several iterations may be required to identify and resolve all missing macros and copybooks. GUAM E NO Support one or more GUI Graphical User Access Method dialogs for MCS, TN3270, or graphics user interface. INIT E YES Initialize all registers to hex x'F4', all memory to hex x'F5', and all uninitialized load module areas to x'F6' for easier identification of access to uninitialized registers, memory. or program fields. This default option was adopted when ASSIST option was added after fixing a number of regression test initialization bugs. Use NOINIT to revert to all zeros as work-around for bugs. The x'F6' init was added in v1403d PTF. INSTALL(dir) MALE NO Define alternate z390 install directory to run batch command. The default is set from J2SE Property "user.dir". IPL(pgm) E none Execute 390 program at startup. LIST ALE YES Generate PRN, LST, and LOG files for assembler, linker, and execution respectively. LISTCALL MA YES Generate level macro call and exit comments in BAL file which are used by assembler to format first level macro calls preceding assembler lines with "+" for macro generated source. LISTUSE A YES List active USING definitions each time USING or DROP changes status in the PRN assembly listing file. LOADHIGH E YES Load programs and allocate memory for GETMAIN/STORAGE from high end of first FQE large enough to satisfy request. The ASSIST option changes this option to NOLOADHIGH causing initial program to load starting at X'10000' which simplifies relative address calculations. LOG(file) MALE pgm Set file name for ERR, TR?, and LOG files. The default is the program name. This option is required when running multiple copies of the same program via CMD startup in order to create separate unique ERR, TR?, and LOG files. Otherwise duplicate programs running in parallel will mod the same ERR, TR?, and LOG file. MAXCALL(50) M 50 Set limit for nested macro calls. MAXDISPLAY(80) M 80 Use to increase zcobol DISPLAY line size up to 256 characters. MAXESD(1000) AL 1000 Set limit for ESD sections or entries in one program. MAXLINE(200000) MA 200000 Maximum MLC, MAC, CPY, and BAL source lines that can be loaded into memory during an assembly. MAXLOG(1000000) MALE 1000000 Maximum GUI log file output before truncation begins by removing 50% to limit memory consumption. The only limit on size of log file is MAXSIZE. MAXPARM(100000) M 10000 Maximum length of any string during macro processing. This is an extension as HLASM limit is currently 1024. MAXPASS(2) A 2 Maximum passes of the BAL source by assembler to resolve forward nested symbol references prior to final pass to generate object code. The number of LOCTR statements is added to this limit in order to resolve the final address of each LOCTR section. MAXPC(50000) M 50000 Maximum pseudo code instructions held in cache before LRU replacement begins. MAXQUE(1000) E 1000 Maximum output queue length from any CMD started task before queue messages are automatically copied to GUI output log to conserve memory and prevent stall. MAXRLD(10000) L 10000 Maximum RLD relocation records allowed in a program. MAXWARN(4) MA 4 Maximum MNOTE warning level without generating error. MCALL A NO List each macro call and exit on the PRN assembly listing in addition to first level calls if LISTCALL option is also on. MEM(1) E 1 Memory allocated for 390 program execution in MB. Note for RMODE31 loads and GETMAIN's memory above the 16 MB line must be allocated. For example MEM(32) would provide 16 MB below the line and 16 MB above. MOD L NO Generate raw code file from lz390 with .MOD suffix and no header or trailer and no RLD's. OBJHEX A NO Generate ASCII readable form of OBJ file with support for 31 bit long sections. The default is to generate binary OBJ file which is compatible with mainframe linkers but is limited to 24 bit long sections. PARM('text') E none Define character string parm to passed to executable program via address in R1 at startup pointing to half word length followed by EBCDIC characters. Default length is 0. PC M YES Generate macro pseudo code in cache memory for speeding up macro code that is executed more than once during macro expansion. PCOPT M YES Optimize macro pseudo code by looking for push, add/sub, store sequences and replacing them with inc/dec pseudo code opcodes. These pseudo codes are maintained in a cache in memory during macro execution only and have no affect on generated object code. PRINTALL A NO Suppress PRINT OFF and PRINT NOGEN commands to force all source lines on PRN listing. PDSMEM8 M NO If PDSMEM8 option is specified, error messages will be issued for any macro or copybook file names with length greater than 8. This options is available to provide compatibility with mainframe PDS libraries that are limited to 8 character names. Note zCOBOL and zCICS use names longer than 8 characters such as zcobol\IDENTIFICATION.MAC and cics\CICS_INQUIRE.MAC. PROLOG M YES Generate CICS prolog macro calls DFHEIGBL, DFHEISTG, and DFHEIENT if CICS option and PROLOG options are on. REFORMAT M NO Reformat expanded BAL code to align all opcodes at column 10 and operands at column 16 if possible. REGS E NO Generate GPR register trace before and after each instruction if TRACE option on. RMODE24 LE YES Set 390 load module options to load module below the 24 bit address line. RMODE31 LE NO Set 390 load module options to load module above the 31 bit address line. Note this options requires option MEM be set to include enough memory above the 31 bit address line. STATS or STATS(file) MALE NO Generate statistics file STA with final options listing, macro and copybook file listing, plus all program statistics. If file is omitted the program path and file name are used with STA suffix. SYSBAL(dir) MA pgm dir Define directory for storing and retrieving generated BAL files. This option may also override file name and/or suffix (*.sfx overrides just the suffix in the pgm directory). SYSCPY(dir) MA pgm dir Define one or more directories for retrieving CPY source input files. If the option starts with + the directories listed will be concatenated with current list. Multiple directories are always separated by +. This option may also override suffix by adding *.sfx. SYSDAT(dir) M pgm dir Define directory for retrieving DAT source input files for AREAD. Set to SYSDAT(.) for current directory when no path is specified on DSNAME parm for AREAD. SYSERR(dir) MALE pgm dir Define directory for output ERR files. This option may also override file name and/or suffix (*.sfx overrides just the suffix in the pgm directory). SYSLKD(file) L pgm dir Define input source file for linker commands such as INCLUDE, ALIAS, ENTRY, and NAME. SYSLOG(dir) E pgm dir Define directory for output LOG file. This option may also override file name and/or suffix (*.sfx overrides just the suffix in the pgm directory). SYSLST(dir) AL pgm dir Define directory for output LST files. This option may also override file name and/or suffix (*.sfx overrides just the suffix in the pgm directory). SYSMAC(dir) M mac dir Define one or more directories for source MAC files. If the option starts with + the directories listed will be concatenated with current list. Multiple directories are always separated by +. This option may also override suffix by adding *.sfx. SYSMLC(dir) MA pgm dir Define directory for source input MLC files. SYSOPT(dir) MALE pgm dir Define directory for @file option files. This option may override suffix using *.sfx. SYSPARM('text') M none Define text string which can be accessed by mz390 global macro variable &SYSPARM. SYSPCH(dir) M pgm dir Define directory for PCH output files from PUNCH. This option may also override file name and/or suffix (*.sfx overrides just the suffix in the pgm directory). Note PUNCH output is in ASCII source format and is not directed to the OBJ file. These files may be used as linker input commands via SYSLKD(file) option. Set to SYSPCH(.) for current directory when no path is specified on DSNAME parm for PUNCH. SYSPRN(dir) A pgm dir Define directory for assembler listing PRN output files. This option may also override file name and suffix. This option may also override file name and/or suffix (*.sfx overrides just the suffix in the pgm directory). SYSTERM(file) MALE pgm.ERR Define alternate file for all start/end messages plus any error messages, plus related source file statistics for each file containing errors. The default is the program name with ERR suffix. TEST E NO Start execution with interactive TEST mode active which prompts for commands such as T opcode or G opcode to trace or execution to the next occurrence of opcode name. TESTDD(file) E NO Define input command file to run TEST commands. See regression test rt\test\TESTTST1.MLC for example. THREAD A NO Assign continuing CSECT addresses for multiple CSECT's assembled in the same module to help identify location of instruction and data labels. TIME or TIME(seconds) MALE YES Limit execution time of each program to the number of seconds specified. The default is 15 seconds. This option is turned off if NOTIMING specified. Use NOTIME to allow tasks such as SOA servers like z390CICS to run continuously while still supporting application use of timing functions. TIMING MALE YES Calculate elapsed time and instructions per second statistics for display on START/END messages and STA statistics. tTIMING also displays current z390 and J2SE version on start message and memory usage on ended message. Note NOTIMING is used in regression tests to force generated files to be identical by using fixed data/time stamp using GregorianCalendar(2005,0,2,22,33,44). NOTIMING suppresses versions on start message and memory usage on ended message. NOTIMING also sets NOTIME which prevents application from using time functions.. TRACE or TRACE(AEGILMPQTV) E NO TRACE or TRACE(E) will turn on ez390 execution trace generation on TRE file and turn off CON. TRACE will display every instruction executed along with address and value of each operand. Any combination of the following trace options can be set using the TRACE(...) option. TRACE(*) will also set TRACEALL. Note the &SYSTRACE global SETC variable can be used to turn any trace options on or off during execution. TRACEA or TRACE(A) A NO TRACEA or TRACE(A) will turn on az390 assembly trace generation on TRA file and turn off CON. TRACEA will display each BAL statement during each pass of the assembler. TRACEALL MALE NO Turn on all trace options generating TRM, TRA, TRL, and TRE files and turn off CON. TRACEC or TRACE(C) M NO Trace copy file code for TRACEM and TRACEP. The default is NOTRACEC to eliminated redundant code that usually just contains global variable declarations. TRACEG or TRACE(G) E NO Turn on ez390 emulator trace generation on TRE file with trace of GETMAIN/FREEMAIN FQE memory management control block changes and turn off CON. TRACEI or TRACE(I) M NO TRACEI will trace each AINSERT showing source on the TRM trace file. TRACEL or TRACE(L) L NO TRACEL or TRACE(L) will turn on lz390 linker trace generation on TRL file and turn off CON. TRACEL shows each CSECT, ENTRY, EXTRN and OBJ file being loaded. TRACEM or TRACE(M) M NO TRACEM or TRACE(M) will turn on mz390 macro processor trace generation on TRM file and turn off CON. TRACEM displays each conditional macro statement executed plus stored values and AIF compare values. TRACEP or TRACE(P) M NO TRACEP or TRACE(P) will turn on mz390 macro processor pseudo code generation and execution trace on TRM file and turn off CON. TRACEP shows each conditional macro pseudo operation performed for each conditional macro statement and the values of all variables. TRACEQ or TRACE(Q) E NO TRACEQ or TRACE(Q) will turn on ez390 emulator QSAM/BSAM DCB I/O trace generation on TRE file and turn off CON. TRACES or TRACE(S) M NO Displace MLC source lines on console regardless of CON setting to help locate any loops, waits, or hangs in large macro process. If MCALL is also on, then *MCALL and *MEXIT comments will also be displayed to show location with nested macros. TRACET or TRACE(T) E NO TRACET or TRACE(T) will turn on ez390 emulator TGET/TPUT and TCP/IO trace generation on TRE file and turn off CON. TRACEV or TRACE(V) E NO TRACEV or TRACE(V) will turn on ez390 emulator VSAM ACB/RPL I/O trace generation on TRE file and turn off CON. TRAP E YES Trap any unexpected J2SE program exceptions and generate emulator 0C5 exception which can be handled by SPIE/STAE exits if defined. NOTRAP can be used with Eclipse source debugger to stop at J2SE statement causing exception. TS MALE NO Generate JDBC compatible time-stamp on all TRACE and ERR file records for use in debugging time dependent issue. VCB E YES Generate VSAM cache buffer for improving VSAM performance by storing most recently accessed records and indexes. XREF A YES Cross reference symbols to source lines in PRN assembly listing. ZSTRMAC M YES Support expansion of ZSTRMAC structured conditional macro code instructions during loading of MLC, MAC, and CPY files. Note z390 macros in z390\mac directory now are using zstrmac for structured coding. NOZSTRMAC can only be used with MVS, VSE, or other non-structured macro libraries. /SC maximize.ini - the /sc option executes the z390 startup commands in the named file. See the z390 User Guide for list of commands including changing the location and size of the z390 GUI dialog. Environment variables are supported on both Windows and Linux for setting the following z390 GUI options. Environment variables are also used to define the file specifications for DDNAME's used in z390 macro assembler program extended AREAD and PUNCH statements and in DCB's and ACB's for file access. The environment variables for batch execution must be set in z390 BAT command or in individual batch commands prior to executing program since each batch command runs in its own environment space. Z390BROWSER=cmd.exe /c Start - default started task for web browser started by z390 to access www.z390.org online documentation. For Windows Start invokes IE. For Linux the default is firefox. Z390COMMAND=cmd.exe - default batch command processor used by z390 GUI for unknown commands. On Windows this is the standard Windows BAT file command processor. For Linux this is a Perl script named cmd.pl which processes Windows compatible BAT command files and performs the same functions. Z390EDITOR=notepad.exe - default GUI editor started by z390 GUI using the EDIT command. For Linux the default is gedit. BAL MA ASCII Basic Assembly Language generated ASCII source file generated by mz390 when option BAL is specified. When option ASM is on (the default), mz390 starts az390 as a separate process running in parallel and passes generated BAL statements directly to it. This allows the first pass of assembler processing to be overlapped with macro expansion and eliminates need to write this file to external disk. Basic Assembler format is free form within first 71 characters with optional label starting in position 1 followed by opcode followed by operands if any. If continuation is required a non-space character appears in position 72. Positions 73-80 may be used for sequence numbering. The ICTL instruction may be used to change these default setting but it is not recommended as the macro and copybook files are all in the default format. Embedded AREAD records longer than 71 characters must be in standard continuation format for preloading of MLC and MAC files (a z390 restriction). Note the default NOALLOW limits AREAD and PUNCH records to maximum of 80. ERR MALE ASCII Output log of all START and ENDED messages plus any errors plus any error file references. Text file with messages showing start and stop statistics for each step and any error messages issued by those steps. A cross reference of all macro and copybook files with errors is included at the end. For full cross reference of all macros and copybooks used see STA file. LOG E ASCII Output log of for GUI or batch command execution controlled by CON option Test file with messages issued udring program execution including start and stop statistics plus any errors and any WTO write to operator messages. LKD L ASCII Optional input command for linker (INCLUDE, ENTRY, ALIAS, NAME) Same format as BAL. MAC M ASCII macro source files Same format as BAL. MLC M ASCII macro assembler source programs read by mz390 Same format as BAL. MOD LE binary Binary code output from linker with no header and no RLD records. This type file can be created using option MOD and can be loaded as a data table by Micro Focus CICS, Binary file with all CSECT binary data. For example DC C'ABC' using option MOD will result in 3 byte MOD file containing x'C1C2C3'. ASCII Output relocatible object code file for macro assembler with two format options. The default is mainframe linker compatible relocatible object code 80 records (ESD, TXT, RLD, and END). When OBJHEX option is specified for assembler, ASCII readable text extended format supporting 31 bit long sections is generated. The z390 linker can read either format by examining file. OPT MALE ASCII Optional options files referenced via @file option from command line or other option files Text file with z390 options entered in free format delimited by spaces. An * will terminate options on a line and start comments on that line. PCH M ASCII Output text files written via PUNCH statements in macro processor using optional ID=, DDNAME=, or DSNAME= extended parameters. The default is pgm.PCH. Text file output which is not limited to 80 byte BAL format using ALLOW. Any macro program generating BAL output must format continuations. 2) hex bytes in instruction or data with up ot 8 bytes per line. Direction PRINT DATA will force listing all data 8 bytes per line. 3) (file#/file-line#)generated-line# identified the file # and the relative file line #for the MLC, MAC, or CPY file that the generated line came from followed by the sequential generated line #. 4) Flag field has + for macro generated lines, and = for line from copybook. 5)BAL line with label, opcode, and operands. STA MALE ASCII Output statistics file listing options set, program statistics, and file references Text file with detail statistics on each step including all option settings, complete macro and copybook cross reference for mz390, and execution statistics. TRA A ASCII Trace output file for assembler (lists each line being assembled during each pass) Text file with ma390 assembler trace output including source file name, relative line, generated line, relative hex offset, and source statement for each assembler pass which may be 2 or more depending on usage of LOCTR. TRE E ASCII Trace output file for emulator (lists each instruction, address, and operand values) Text file with ez390 emulator execution trace output showing, hex psw address, condition code, hex instruction, mnemonic, operand register and storage values at the start of each instruction. Blank line inserted for each branch to non sequential address. The high bit of PSW hex address indicates 24 or 31 bit address mode. TRL L ASCII Trace output file for linker (lists each OBJ record processed) Text file with lz390 linker trace output including ESD external symbol hex addresses and lengths, TXT text records with relative offset within ESD and hex data. RLD relocation records showing hex offset, field length, and ESD symbol. TRM M ASCII Trace output file for macro process (TRACEM lists each macro line executed, TRACEP lists every macro pseudo code instruction executed showing the current value of local and global variables used in SET statements and AIF statements etc.) Text file with mz390 macro processor trace output file which is typically generated in parallel with the generation of the first pass information in the TRA file since mz390 and az390 run as concurrent tasks. This file includes source file name, relative line number, and source macro statement. For generated BAL output lines the source file# and relative line# cross reference is also include. If the TRACEP option is specified, this file also includes listing of the generation and execution of macro pseudo code instructions. ZSM M ASCII ZSTRMAC Structured Conditional Macro source programs. Use ZSTRMAC.BAT file1 file2 to translate ZSM type file to standard HLASM compatible MLC type source file. See option MOD and file type MOD to create code without header or any RLD's.